An endurance race dubbed the world's toughest row has finally got under way, two days after gale-force winds caused it to be postponed. Some 25 teams - featuring several British and Irish competitors - pulled out of La Gomera marina in the Canary Islands on Thursday, bound for English Harbour in Antigua as part of the Talisker Whisky Atlantic Challenge. The 3,000-mile race across the ocean is expected to take at least 30 days for the fastest teams, with up to four people on each boat. The race was due to begin on Tuesday but was delayed by 48 hours after winds of up to 40 knots prompted safety concerns. Race director Carsten Horen Olsen said: "This is the biggest and most global race to date and we're thrilled that teams from all over the world have travelled to La Gomera to take part in the world's toughest row. "Year on year, we are bowled over by the records smashed, the dedication of the fleet and the incredible journey we're privileged to take part in as we follow and support all of our participants. "With weather looking favourable this winter, we're looking forward to our biggest record-breaking race yet." Former Ireland rugby player Damian Browne and four-time Invictus Games gold medal winner Jordan Beecher are among those who lined up their fibreglass vessels in La Gomera for the start of the charity race. 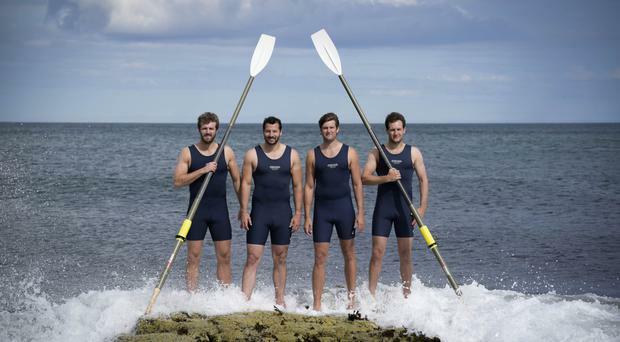 Another team, London-based The Four Oarsmen, has raised more than £350,000 for Mind and Spinal Research. The Carbon Zerow team is aiming to be the first certified carbon-neutral expedition to cross the Atlantic Ocean.